Jim Weigand emails to say that VDOE has just reported the 2015 excess Required Local Effort (RLE). The RLE is the local expenditure required by the Standards of Quality. The 2014 data are here. 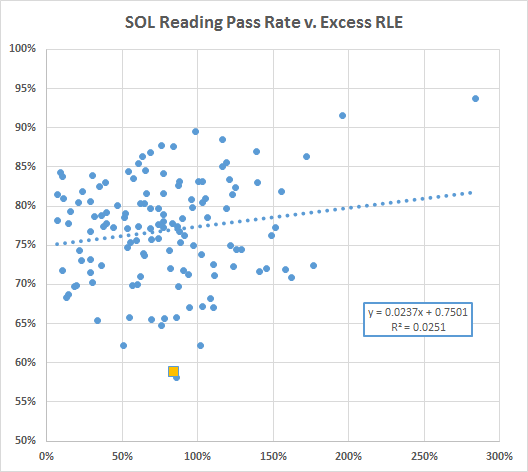 I have juxtaposed the excess local effort, i.e., the expenditure above the requirement expressed as a percentage of the RLE, with the SOL pass rates. Notes: There are no RLE data for Lee County. VDOE reports RLE data separately for Greensville County and Emporia and for both James City County and Williamsburg, but SOLs for the combined systems; I have omitted those data. VDOE also reports RLE data separately for Fairfax County and City but SOLs for the combined system; because the county is so much larger, I have used the county RLE datum. With those caveats, here are the reading data. Richmond is the gold square. 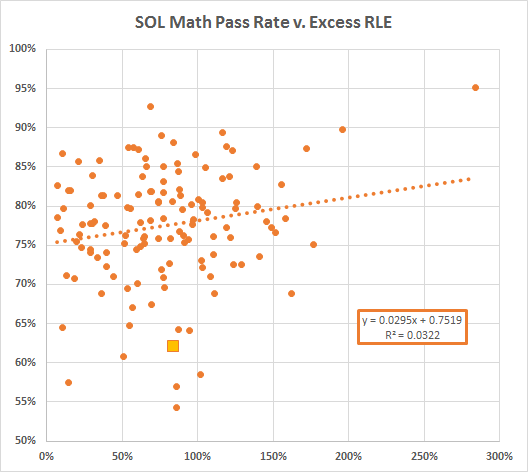 The least squares fit suggests that doubling the RLE is associated with a 2.4% increase in the pass rate but the R2 tells us that the pass rates and excess RLEs are essentially uncorrelated. The math data present essentially the same picture. The high price, high score jurisdiction is West Point. The second highest price, not quite as well scoring, jurisdiction is Falls Church.